The new MB35 will hold virtually all of the medical supplies needed for a trauma call, less the oxygen bottle. It features multiple pockets, pouches, loops and compartments - including four removable color-coded zippered pouches for quick access to high priority items. The main hold also includes six removable foam dividers that can be customized along with the colored pouches - or removed completely to suit the users' needs. ***THE KIT: Tweezers, Kelly Hemostats, Trauma Sheers, Bandage Sheers, Penlight, Ammonia Ampules (10), Band-Aids (100), 4"x4" Gauze Pads (50), 2" Roll Gauze (2), 3" Roll Gauze (2), 4" Roll Gauze (2), 2" Self-Adherent Bandage (2), 2" Elastic Ace Bandage (2), 5" x 9" ABD Pad (2), 8" x 10" ABD Pad (2), 1" Roll Cloth Tape, 2" Roll Cloth Tape, Iodine Wipes (10), Isopropyl Alcohol Wipes (10), Triple Antibiotic Ointment 1/2 oz, Instant Cold Packs (4), Eye Pads (2), Triangle Bandage (4) , Eye Wash Irrigation Solution, Exam Gloves (8), Universal SAM Finger Splint (2), Oral Glucose Gel, Sting & Bite Relief Pads (10), Digital Automatic Blood Pressure Cuff, Premium Cardiology Stethoscope, CPR Mask (2), Berman Airways Kit (6), 10" x 30" Multi Trauma Dressing (2), Bag Valve Mask (MPR), 4-1/4" x 36" Roll Splint (2), 4" x 4" Transparent Chest Seal, Adjustable Cervical Collar, 2oz Burn Spray w/ Lidocaine, 2oz First Aid Antiseptic Spray, Emergency Mylar Blanket (2), QuickStop Hemostatic Spray (1.69oz), QuickClot 4"x4" EMS Bandage, Tourniquet, Petroleum Burn Dressing 3"x9" (2), Tongue Depressor (2), Suture Set, First Aid Guide, Digital Thermometer, Thermometer Sheath (2), Israeli Bandage 4", Folding Pocket Knife, Fingertip Pulse Ox, Nasal Airway Kit. Pulse Ox is not intended for medical use, it is rather intended for use in sports or aviation. 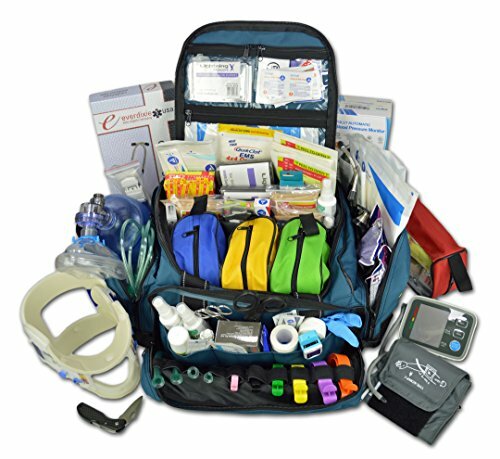 Mueller Hero Utility Medical Bag - 10" x 5" x 5"